The repeated langhana pattern (3, 4, 16) of midrange and micromovements was gradually introduced to introduce a sense of containment. During summer I found especially during the first part of the practice my mind was jumpy … and this pattern helped in collecting myself. The most prominent theme I have been exploring is softness. It is an extensive and subtle exploration … and I am not, at this time, interested in writing about it. During the recovery practice period I replaced maha mudra with janu sirsasana – I was not able to support a quality stay in maha-mudra. In the last 4 weeks I have re-introduced maha-mudra. I have left in janu sirsasana as I feel it is still supporting opening of the hips and is a good preparation for maha mudra. I may phase out janu-sirsasana in the coming weeks. I have been through of waves of distraction and regular practice and I feel I am the end of a cycle fo recovery … so finding my way back to a core stability I had not felt for some time. The length and quality of breath has been recovered. Most of the stiffness that built up in my shoulders and hips has softened. 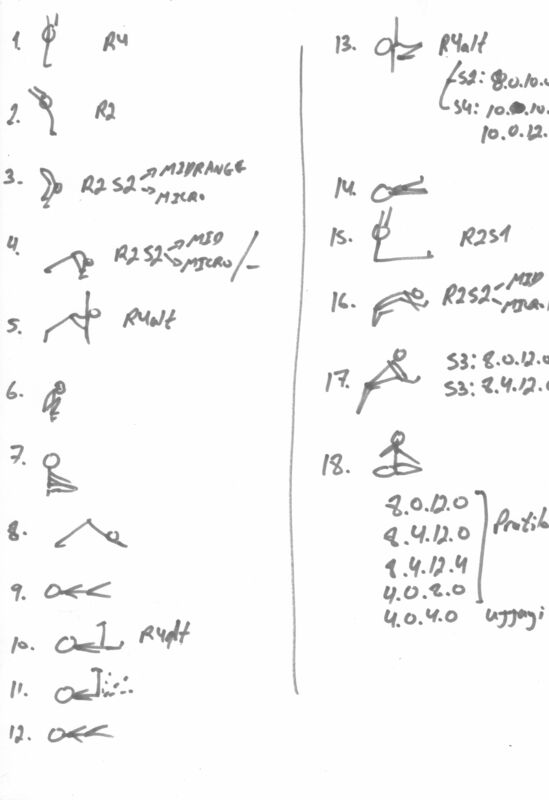 I have not explored the alternate practice path with shoulder-stand and lying back-bends. I feel physically strong, emotionally vulnerable, energetically stable. In recent weeks I have not been sleeping well. I have resume some semi-regular software development … and I do feel its disturbance. In Pranayama I have only recently transitioned from an Anuloma practice to Pratiloma. I was practicing an Anuloma with a base ratio of 10.0.15.0 x6br. I attempted a direct transition to Pratiloma but that was too much and exhausted me (it involved a transition of both technique and an increase in number of breaths from 6 to 8). I started a path of transition by gradually building up to 8 breaths in anuloma. But then I decided to shift down to an 8.0.12.0 ratio so that I could access the more subtle quality of Pratiloma. I am now settling well in Pratiloma and hope to resume the path Paul outlined for me last spring.